Final Update 9/5/13: Dayne's Chicago Beef & Dawgs opened on August 24th at 2951 E. Thousand Oaks Boulevard, Thousand Oaks! Visit www.dayneschicagobeef.com or call 805.906.0888 to learn more. In other news, Garage Dogs, which opened down the street on Thousand Oaks Boulevard on April 23, 2012, recently closed, though a sign on their door indicates they will be seeking a new location. That's too bad as I know several friends frequented Garage Dogs quite often. Update 7/14/13: Dayne's is still working on a grand opening date. Follow www.facebook.com/DaynesChicagoBeef for updates. 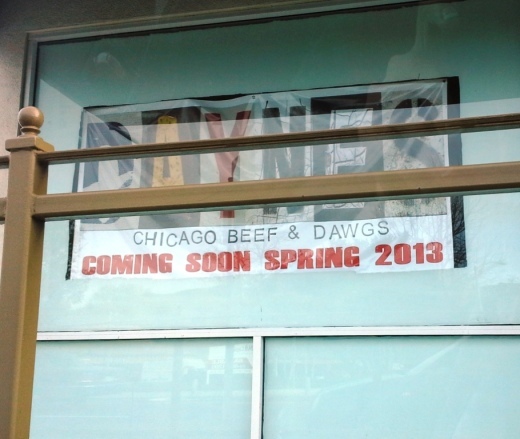 Updated 3/25 (original post 3/7): Dayne's Chicago Beef and Dawgs indicates its grand opening will take place on Memorial Day weekend on its Facebook page. Conejo Valley Guide Facebook Page follower Lauren T pointed out this new eatery coming "soon Spring 2013" to Thousand Oaks. The soon-to-be Dayne's Chicago Beef and Dawgs will be located at 2951 E. Thousand Oaks Boulevard, adjacent to my wife's favorite Chocolatine, in the space previously occupied by Channel Islands Scuba (which for some time now has been located down the street at 3200 E. Thousand Oaks Boulevard).